Lonely Planet Travel Guide instructs its readers not to leave Cape Town with stopping in at Charly’s Bakery to taste one of their cupcakes and brides move their weddings to Cape Town so they can have a Charly’s Wedding Cake – or so I heard. Incredulous, I decided to investigate and taste for myself. Well …it turns out its all true and now I too ♥ Charly’s Bakery! So how good are these cakes really? Well, you have to taste one to actually believe it – that’s if you get past ooohing and aahing about the look of their artistic creations … cupcakes, weddings cakes, party cakes and just-because cakes – they are all totally gorgeous and unique. Every cake that comes out of Charly’s Bakery is a singularly spectacular creation – a work of baking-art made just for you. And the taste … it’s sublime. 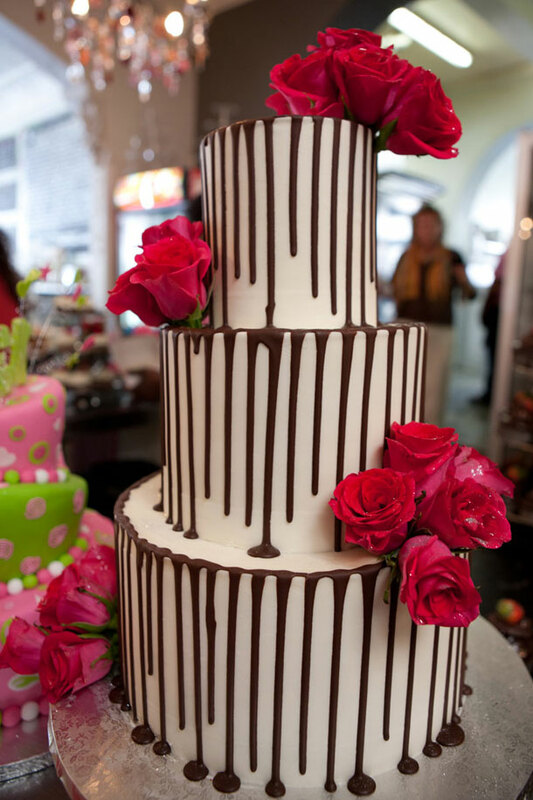 The photograph above is a 3-tier Wicked Chocolate cake iced in white chocolate ganache, decorated with a dark chocolate drizzle and bunches of deep pink roses. The photos below are just a teeny tiny selection – you need to go visit their website to view what they do. Depending on your wedding style, they’ll produce a beautiful cake for you or, if your wedding is not traditional, the girls at Charly’s will create something fun, quirky, whimsical, fantastical … whatever you need they’ll create a show-stopping wedding cake your guests will be talking about for months. I kid you not! Charly’s specialise in Wicked Chocolate wedding cakes, which are made with a dense, moist, brownie-style chocolate cake. Have a look at the photos in their photo gallery (link below) to see the range of wedding cake styles they do. Consider the following; When and where is your wedding being held? How many guests are you having? Will you be serving the cake as the main dessert, as part of dessert or not at all? Their wedding cakes range between R1500 and R5500 and serve between 40 and 150 people. The cost depends on the size, the number of tiers, decor, and delivery – each cake is quoted individually according to the couple’s needs. 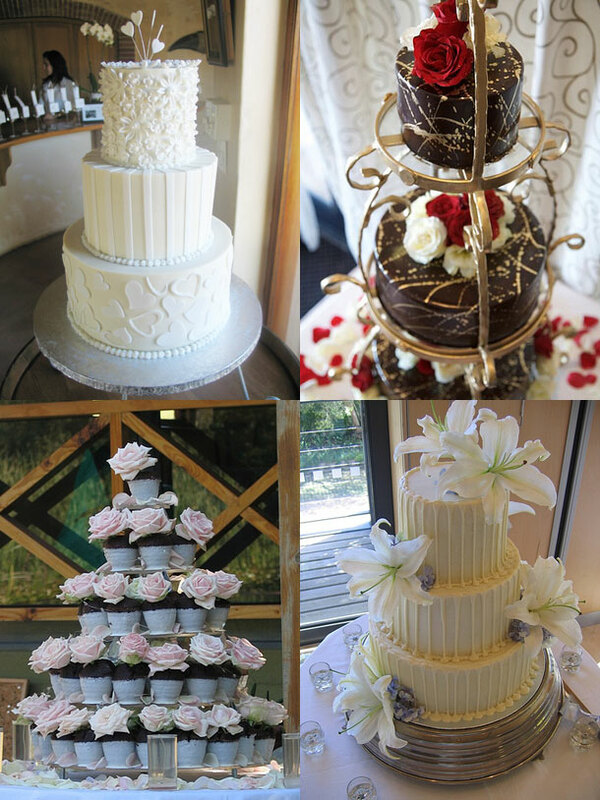 You’ll need to arrange an appointment with Jacqui to discuss the various options you’d like for your wedding cake, after which she will send through a final quotation. You can contact Jacqui and her Team on +27 (0)21 461-5181. If you want a meeting with Jacqui to discuss your requirements, you will be charged R250.00 for a wedding cake consultation, (to be paid on the day of the consultation), which will be deducted off the cost of your wedding cake should you choose to get your cake made by Charly’s Bakery. This consultation fee includes 30-60 minutes meeting, tea/coffee/cold drink/etc, as well as a cake tasting. Opening Hours: Tuesday to Friday from 08h00 to 17h00, Saturday from 08:30 to 15:00. I saw your shop on Dstv in Nigeria & am quite excited to tell you that your cake designs are very impressive. Hi i would like to have a cake for my daughter shes turning 10 on the 15 may 2012 and she wants a brats cake.Any idea and whats the cost??? I visited your shop for the first time to day and i was amazed to see the vibe withine the shop. i must admit that i have never seen a cake shop like yours before and thank God to the person who recomended your shop to me. I have 2x wedding coming up and im not hesitating to pop in and make an apointment with the Manager as i was advized by one of your staff. I hope i will get what i saw and not be dissapointed. PLEASE WOULD LIKE TO KNOW IF IS POSSIBLE FOR TO ORDER SPONGE CAKE FOR MY WEDDING NOT FRUIT CAKE CAN I PLEASE HAVE DIFFERENT CAKES AND PRICES. WOULD LIKE TO KNOW HOW MANY DAYS DO I NEED TO ORDER IN ADVANCE. I CAN ONLY SAY WOW!!!! !SHOULD YOU NEED FREE EXTRA HANDS WITH THE WASHING OF YOUR USED EQUIPMENT I AM JUST AN EMAIL AWAY. Would love 2 have 1 of ur cakes 4 my baby girl she’s turning 1year old 13 December 2011 any any ideas?